This article is a transcription of a Sigma Nutrition Radio podcast episode (this one) that was extremely popular. 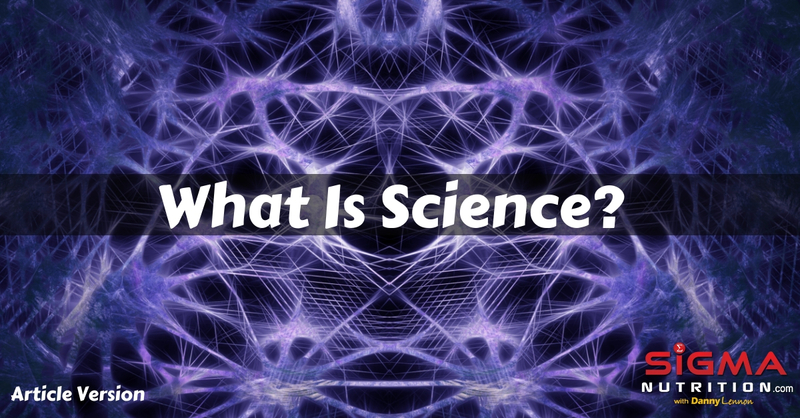 The episode centered around an attempt to answer the question “what is science?”, or in other words, an attempt to get people to understand and appreciate what it really means to be a scientific thinker. I want to say thank you to the people I got to chat to who I’ve been able to put some of the thoughts across in this episode, Brad Dieter, Mike T. Nelson, Andy Galpin, Ciaran O’ Regan, Trent Stellingwerff, John Kiely, thank you, and thank you to everyone else who has shaped my own views in thinking about this question who I’ve talked to and who have not been mentioned on this episode but in private correspondence and discussions and just how they have shaped my views and thinking around this and have allowed me to think through some of these ideas. Danny Lennon: Now onto today’s episode and I wanted to just take some time to discuss an idea of what is science. And I’ve become fascinated with thinking how to articulate this important concept because we say the word a lot, we talk like science is a simple term, and we take for granted that we are operating in a science based way. But I am becoming increasingly aware of just how many people either don’t know or don’t appreciate what science truly is. So I think for the average person on the street, science is a word they associate with experiments that are done in a lab, science is something reserved for those lab coat wearing geeks who will do some fancy stuff and then just tell us the definitive truth about something at the end and tell us exactly what the answer is to these certain questions. But that is of course not science. To me, science is at its essence, the best tool us humans have for removing our own limitations and bias from answers to questions about the natural world. And science doesn’t deliver us the answer, science allows us to kind of tiptoe closer and closer to the truth. And recently I was talking with Brad Dieter who’s been on this podcast before and he sees the question of what science is as two separate questions. Brad Dieter: This question can be hard to answer as it poses several different questions inherently. My view on science is shaped largely by my own epistemology. I categorize this question into two major ideas, what is science meant to be and what is science pragmatically. Danny Lennon: So considering these two questions, how do we go about answering that first question? As Brad poses, what is science meant to be, what is it that allows us to the get to the core of that question? Brad Dieter: Science is meant to be an objective way to find out the truth of our universe. It, in the purer sense is a process and it is a systematic way of inquiring about the world, thinking and testing your own beliefs against what the universe tends to show us. It helps us address our cognitive and emotional biases and our own intellectual shortcomings. It often requires external apparatuses that extend our senses while also removing the subjective nature of our experience. Even in this sense, science is limited, it can only answer a narrow range of questions at any given time. It requires a piecemeal approach to understanding larger truths. Furthermore, and more fundamentally, it approximates the truth, and never allows us to fully know the truth of something. This is due to the nature of the scientific approach, how we think about math and statistics, and the limits of our ability to probe the universe. Danny Lennon: And it’s interesting, at the Sigma Nutrition Conference in 2017, I opened up with a slide with just two words that summarized what I aimed to present that weekend. And that slide simply read, transient truth. That is the information I try to dispense at any time is what I believe to be accurate and true at that specific moment. But I equally acknowledge that that conclusion maybe transient, it may be liable to change and it’s kind of fluid. I may change that stance based on new information that either emerges or new information that I am just simply unaware of right now. And this is how the kind of scientific consensus on any topic should really operate. We currently have a set of transient truths so they are not an absolute truth or the definitive truth that will withstand the test of time forever but more so these transient truths that may or may not be coherent with the actual real fundamental truth because we most of the time can’t really know that at any one time. Sure, we can do that with mathematics but with science and especially biological sciences that deal with humans, we are not really at that point. So how do we work out what the real truth is or the absolute truth in a sense? Mike T. Nelson has been involved in research and academia for a long time as well as working in practice and he is one of the people that so often thinks about interesting questions and tries to explore them but very much with a critical and scientific mind. So how is it that we can go from an initial idea of concept through to actually seeing the probability of that being true? I think that is what is at the core of what science is and Mike explains. Mike T. Nelson: I would say at a high level I think of it as what information do you have, can you collect, observational, research, other people, there’s many different ways you can then collect that information, and how does that form your mental model of what it is, and then how do you test that model, so that could be experimental work, that could be just thought experiments or different things like that. I think if I were to simplify it, that’s kind of what I would say, collect information, I am going to collect it, you are trying to keep your bias out of it as much as you can, what mental model do you kind of create with that, and then the key part of that is how do you disprove that model. Danny Lennon: So inherently that means science is a method of searching for answers based on trying to disprove our current hypothesis or idea or we are trying to prove that it’s incorrect or at least look for counter examples which show that our idea is correct and then we will know we need to modify or change or completely throw out. As a way of a nice analogy, Mike goes onto explore the idea if we were going to attempt to “prove” there are only white swans and the mistake you can make in doing that is to prove that there are only white swans, just go and keep looking for evidence of white swans and accumulating more and more and more and more instead of looking for the counter example as Mike lays out here. Mike T. Nelson: Right. So the white swan versus the black swan, right? A guy spends his whole life looking for white swans, spends two decades, travels every country, finds them everywhere. And some guy in the Southern US wakes up in his boxer shorts in the morning and takes a picture of a black one hanging out in his backyard and goes, “Hey, look a black one.” It’s like, well, yeah, I can’t really say now that all swans are white because ding it, someone found a black one. So he should have been spending this time looking if his hypothesis is all the swans are white, he should have been looking for the different colored ones, he should have been looking for everything that was not white, he should have been trying to disprove what his hypothesis was, not spending all this time trying to reaffirm what it was. And I think that’s the hardest part, so I spend a lot of time thinking, okay, this is the model that I believe is true based on the data that I’ve collected, that I collect all the right data, was I biased in my data collection, did I not look at some stuff just because I am human and everyone’s human, and then how do I try to disprove that. If I think X is true, what would I need to know to try to disprove that and I think that would be a little bit of a faster path. Danny Lennon: When conducting science, we are not aiming to search for confirmation of our beliefs. Actually to the contrary, science is a method of searching for answers based on trying to disprove our current hypothesis. In other words, we are trying to prove that our idea is incorrect. And if we can prove that it’s incorrect or we can disprove this idea, then we know that we need to throw that out and that idea isn’t correct or we can at least revamp it in some way. If we are unable to disprove it, then that idea lives to fight another day and so with each of these cases as we replicate trials of it not being disproved and seemingly more and more unlikely to be true, within could be more and more confident and we can more confidently assume that our idea maybe correct. And when something has been tested so many times independently by many different people in various different contexts, with nothing to suggest that it is not the case, then we may be able to at least assume that idea to be something that we would call true. Still knowing that, sure, we can never get to an absolute true, and we can never truly know when it comes to some of the stuff within biological sciences, but just can be pretty damn sure, given the limitations of the human brain and our ability to comprehend the natural world that what we are suggesting is most likely believed to be true. Ciaran O’ Regan is a coach here at Sigma Nutrition as well as being a very close friend of mine and we’ve discussed some of these topics quite a lot, and most recently you may have even seen him write an article discussing the idea of uncertainty in science and trying to delve into what being science-based is. And so recently, as we were chatting, some of these ideas emerged again that I think are very relevant to this discussion. Ciaran O’ Regan: Essentially, what the position science leaves you in which is why I think of it as the axiom of the infinite unknown is that once you accept the axiom that there is an infinite amount of information that you don’t know, you not only do not know it, but you can’t know it. Then, you are left in this situation where, well if I can’t know everything, how do I disseminate the most accurate view of reality from a less accurate view of reality, how do you disseminate what is more likely to be accurate than less accurate. And that’s where the scientific method comes in, where essentially humans are these pattern recognition machines and we spot a pattern in nature, we develop a model to test that pattern, we test that pattern in an experiment and then as thoroughly as we can, comprehend that model based on whatever knowledge and technology we have access to. And then that information gets contributed to a body of knowledge, and that part of the knowledge can be formal, which can be the scientific literature or it can be informal and the scientific method can be used in informal settings even in determining your political views, and determining what way to vote in an election. It’s the same idea, it’s essentially testing your views and not attaching yourself to those views. Essentially, science, the most important aspect of science that I can think of, that I can wrap my head around is this idea that science, the essence of science is not identifying as your views. It’s not about what you know. It’s identifying as the thing that has those views, thereby allowing yourself to change your views in light of evidence and update them, because not only are humans – humans are these fallible, limited, finite beings and nature is massively complex and infinite, and science is our most efficient and best chance we have of getting the most accurate view of reality possible. Danny Lennon: Related to the idea of what is science, we can also ask what is a scientific mind. How does a scientist think and why is scientific thinking important? John Kiely is a Senior Lecturer in Elite Performance at the Institute of Coaching and Performance at the University of Central Lancashire in the UK and he’s published a longest of peer reviewed work, most notably on challenging ideas and dogmas on stress and periodization theory and he has an extensive background and practice of working with top level elite athletes. One of his key qualities is his approach to what being a good scientific thinker is and he articulates that idea extremely well and putting that, when we are trying to explore this idea of what science is, we have to place being a critical thinker and a scientific thinker at the center of this. John Kiely: I can not only give my version of the truth but maybe I will start with what it isn’t. It’s not academia, it’s not academic papers, it’s not all the rubbish and crap and go with that word. For me, what it is, is it’s critical thinking really, it’s here’s what I think I know, here’s what I know about the world we live in, it’s complex. Yes, it’s unknown but I can know it with more precision. And then it is just – and for me it always comes down to, if you want to understand something better from a scientific perspective, from a critical thinking perspective, it costs you, it takes time, it takes cognitive effort, it takes deep thought. It’s not enough to read or just listen to podcasts or do any of those things, they are all the essential to take in messages but at some stage for me, my scientific processes sit and wrestle with the ideas that are difficult for you in your context and don’t be afraid to sit and wrestle with them, don’t be afraid of doubt and insecurity because I think it’s only when you batter your way through that that you come out the other end with a deeper sense of understanding in the phenomenon that you are interested in. Danny Lennon: And so I think the obvious answer to why scientific thinking is important is that it gives us the best chance of being right. Us humans are fraught with errors when we try to consider things without scientific values. We are prone to bias, we will be more likely to believe something, just because we want to and this happens even when we are aware that bias exists. We all know there are such a thing a bias, and we are all susceptible to it, yet it still happens. And it’s almost impossible to be bias-free. Us humans are also just inherently creatures that make decisions based on emotion; and even for us who like to be rational and logical, we base decisions on emotions much more than we care to admit; and even in cases when we believe we are being totally rational and a 100% logical, usually those decisions are still driven by emotion and we can just justify them in retrospect through logic and rationality. And so, the perfectly rational person doesn’t exist; and so to make rational, logical, and objective decisions or conclusions, we need a tool, a tool that removes these human elements from a process as much as possible. And as of right now, science is that best tool that we have for doing so; and one particular thing that we can do to think through some of this that Ciaran O’ Regan has mentioned, both in his article and to me personally, is around this idea of making sure that if we have a particular viewpoint on a topic that we distinguish between us being a scientific thinker who is searching for truth and currently holds this certain view versus getting our whole identity wrapped up in a viewpoint and almost becoming that. Because we’ve seen this in every particular camp where dogmas are present, it’s when people attach their own identity to a view and because of that you are going to run into trouble. You are not going to be able to disconnect from it and this is where dogma sets in, as opposed to being your identity is more I am just a scientific thinker who just happens to currently have this view. And I think Ciaran articulates this point particularly well when we are looking at being someone who has a certain opinion versus identifying as a certain opinion. Ciaran O’ Regan: The most powerful and permanent aspect of science is that it is more, far more, important how you think than what you think. What I mean by that is: science in its most pure form is about, in my opinion, identifying your sense of self, not with your views and with your ideas about the topic, but instead of identifying your sense of self with the thing that has those ideas or views around the topic. And the difference between and has there may seem subtle but the difference is quite enormous because when you identify your sense of self as your ideas and as your views then you are shackling yourself to a fixed point, you are locked into an ideology, you are anchored into potentially something that isn’t correct or isn’t as correct as other views. Danny Lennon: And as Brad Dieter mentioned earlier, we can view science in two contexts. Philosophically, science can be something used in everyday life and decision-making, just being a critical thinker, wrestling with ideas like John Kiely outlined, but there’s also a very clear way of doing good science within actual research settings, there’s a clear process with steps to follow, that a scientific method that we all learned about in school but of course it stretches way beyond that. And talking about how to conduct good science at that level is probably for much different conversation at a different day. We can get into the weeds on study design, statistical analysis, interpretation of results, and these are all high level skills with experts in those given niche fields that will know far more about that then we can discuss here and are very relevant for people working in academia and wanting to be the best scientists they can. But this episode is more about communicating a broader idea of what science is and communicating something that can be central to all of us as learners even if we are not involved in academia or carrying out scientific trials. And that is learning how to think, sharpening our skills as skeptics while still leaving the door of open-mindedness ajar, just enough that we can still bring in new things and not be completely dismissive because of lack of conclusive evidence on something. And so, at its core, when it comes to application, science is both an activity and it’s something that is systematic and this is something that’s Trent Stellingwerff described to me when he was talking about the idea of what science is particularly in the context of applied sport science. Trent Stellingwerff: I guess in a general sense science to me is the strategic or intellectual or practical activities in the systematic study of anything that you are doing, that can come through observation, experiments or outright academic experimental design, but it’s systematic and strategic. I think within sport science and applied sports science, there is a spectrum between innovation through to research that underpins the definition of science. To me, innovation is any new or novel applied approach using existing knowledge in your current paradigm, this could be as simple as an athlete trying carbohydrate loaded for the first time, that’s an innovation for that athlete, or it could be someone in your organization that comes up with a more efficient way to analyze research data. On the other end of the spectrum is research. Research requires specific academic training and involves a scientific process, hypothesis and advanced approaches to scientific design and statistical analysis. Somewhere in between might be in-house case studies or pilot type science, pilot research. Finally, in the trenches, in the application of science, I think it’s important to recognize both explicit and tacit knowledge, explicit meaning the type of knowledge you can pass on very easily through written word or through research papers, but tacit knowledge being the type of coach intuition, in terms of a valuable experience knowledge that is difficult to write down or transferred to others. This tacit coach knowledge can be an absolute goldmine for applied sport science ideas and application and innovation of those ideas. Danny Lennon: Science is essentially this thing that is ongoing, it exists because we still don’t know things. If we are conducting research on something, it is because we don’t understand it fully yet. And that’s important because so many times even those of us within an evidence based community or those very aware of science and reading up on research, people are still making this idea that when we talk about a concept it is completely understood and we know the exact truth or absolute truth about it. And really if we are still conducting research and still investigating it, we still don’t fully understand it. Why would we investigate something we are so certain of? So remember that when discussing something that has ongoing research on it, i.e. basically nearly everything when it comes to nutrition. We don’t fully understand it nor know everything about it, and we are still unsure about certain aspects and questions. Now, there are some things where we have so much strong evidence we can again approximate that to be most likely true and so likely in fact to be true that we can talk about that as a “truth” when we are discussing things. And these are things that we just know are going to be the case and that is because we’ve approximated so clearly and there’s such strong evidence behind it that we are accepting that position as truth. But there’s other areas where there’s not as much and there’s still a bit of gray areas, but being aware of that uncertainty and embracing that uncertainty is important. Dr. Andy Galpin is a researcher at Cal State, Fullerton and is one of my really favorite people to hear articulate ideas around science and evidence based practice, and when I asked him about this, it was quite clear that through his own experiences, he had came across the need to be a deep scientific thinker and how just by thinking through things pragmatically and practically, we can kind of at least start to accept this uncertain nature of science and to embrace this uncertainty. So I think hearing how Andy came to some of those conclusions is pretty interesting. And I just remember thinking, if the science truly does say that there are no adaptations to the cardiovascular system from strength training, and there’s some major fault with the science, that just can’t be the case, it doesn’t make any intuitive sense. So my practical experience and my intuition and just thinking back through this biologically, it didn’t make any sense and so from there I really started to question the nature of what science can or can’t be. And so now I defer to those opinions of philosophers like Karl Popper, and that I really believe that science doesn’t prove anything, it just reduces uncertainty. And that’s because of – actually I think Yuval Noah Harari laid this out really well, and his first book sapiens, and he talked about science is founded on ignoramus which is the admission that we don’t know something. And the salient point he brought up in that book is why would we study something if we already knew the answer. So the fact that we are doing science, the fact that we are studying something, it is in and of itself an admission of ignorance, it is an admission that we don’t know something. I think this is really important because as folks like Carl Sagan said that science is a verb, not a noun, it is an action. If you ask something, well, what is a science, that doesn’t mean anything because the science is moving, it’s mosaic, it’s evolving. It is, oh it’s so limiting, once you dive deep onto a particular topic, and you start to realize like we haven’t fully vetted anything, especially in the biological sciences. So to me, really the purpose of science is just to explain and understand and predict the natural world. Danny Lennon: And this uncertainty that we discuss is just unshakable. There is no proving something, we are playing a game of probabilities and I think that’s the best way I would get people to start thinking about these questions of trying to work out what is true, is that we are just constantly playing a game of probabilities. And we are attempting to use the best quality evidence we can in order to determine the probability of certain hypotheses being correct. And in practice, it’s often about making decisions whilst knowing we don’t have a complete picture, we can’t wait for all the research to be in. There’s still areas where we are missing a piece of the puzzle but right here and now we still have to make a decision in practice, every time we are going to make any dietary related decision. Andy Galpin: That’s probably the thing that I’ve spent the most time on is individual context because when we try to explain the scientific data or utilize the scientific data, well, we realize that there’s that internal battle between internal-external validity. And when I am working with athletes, it’s entirely external validity, and so I realize the internal control is gone. And so, what worked in my lab, it will work in an animal model lab or a stool culture lab, well, putting that into practice of the human is far different. That doesn’t mean the science is useless or clearly moving the needle forward in general, but we can’t just jump on every straw that comes out of the stack because that’s probably not going to help us a lot with the internal validity. Danny Lennon: So we do have to make some assumptions. Some ideas have such strong evidence behind them that they are almost certain to be true. Others lack a lot of evidence and we have to do our best with what we have and even sometimes that might be something that just has a collection of anecdotes or potential mechanisms but hasn’t been looked at more than that. And so, when it comes down to the probabilities, we have to take all of this stuff into account and we have to realize that the better quality of the evidence that we have for it, then the more weight to that puts behind that certain idea; and then the more and more of this we have, so the more and more high quality trials with more and more weight, pushes us closer and closer in a certain direction or pushes us away from a different idea. And so over time when we are looking at what does this term body of evidence really mean is that when we take into account all these things where is that weighting us, where is that pushing us in terms of a likely position that’s going to hold true, and that is going to put us in a place with the probability of being correct the highest and at least increasing the level of confidence we can have in a certain position, without ever really reaching a 100% for most of the stuff that we come across. And so, to really round this out, I think I will leave you with the words of Brad Dieter as he describes the second of those questions he mentioned at the outset of this episode asking what is science pragmatically, and I think the thoughts and ideas here are articulated as well as I could have ever wished to have put together and I think it ties together a lot of the themes and ideas you would have heard throughout the people within this episode. So turning back to Brad and asking what is science pragmatically? Brad Dieter: Pragmatically, science is our best attempt to follow the scientific principles which often falls short of the ideal. Science is conducted by humans. We are emotional, irrational creatures who are often persuaded by things other than facts and driven by motivations other than the truth. However, on the whole, a central thing that exists in science that is void of almost anywhere else, especially places like the tech world, Silicon Valley or governmental institutions, is an open form of a rigorous non-politicized discussion wherein there is as close to a meritocracy of ideas as there is anywhere in the world. As science currently stands, it can be used as a tool to support bad ideas, but it is also a tool that can be combat bad ideas. Well, flawed in nature, due to the participations of humans in the endeavor, it is and likely will always be the best tool humanity has at its core to solve problems, especially the existential ones. Danny Lennon: And so I think that brings this to a close. If you, the listener, enjoyed this particular episode, then please do me the favor of sharing it with someone, tag someone on social media, post it to your story, put it in a group of Facebook, email it to a friend, or just let people know that this might be a topic and conversation that they are interested in. And if you want to check out some of the show notes related to this episode, they are at sigmanutrition.com/episode251.